Now let’s play with something that has a 3 figure output power ratings, the Tripath TA3020 amplifier! Some background on the TA3020 chip – it is a stereo 300W (4 Ohm) Class-T Digital Audio Amplifier Driver using Digital Power Processing Technology, see picture below for details. It looks pretty promising on the specifications alone. 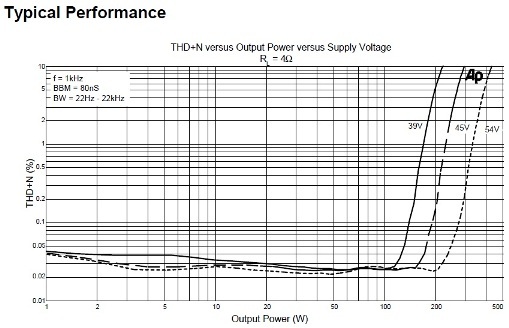 Let’s analyze the performance (THD+N) versus the output power on the graph below for Tripath TA3020. Based on the graph above, the THD+N starts to rise after the ~120W output power level. For higher power supply voltages, the THD+N rise is pushed higher. So, it is recommended that we do not push it too hard over the limit. If you need more power, it is recommended that you supply it with higher supply voltage – observing the 54V curve, it can produce 200W clean power! For those with efficient speakers, I would recommend going with the 39V supply voltage. It sounds better, runs cooler, and is green! Since the Tripath TA3020 is just a class-T controller chip, external MOS-FET (STW34NB20 is used here) is needed to pair with the controller to drive loudspeakers. High current and low Rds-on MOS_FETs are chosen and are mounted very close to the Tripath TA3020 controller. 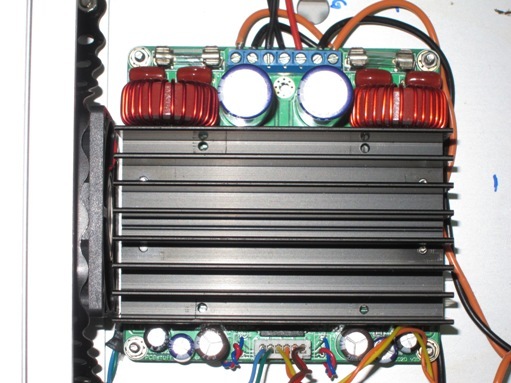 Due to the efficiency of class D / class T design, this amplifier is very efficient, up to around 95%. The size is small and compact considering that it is a 300W per channel into 4 Ohm and 160W into 8 Ohm stereo amplifier! This Tripath TA3020 module size is only 100x100x40mm. If one needs more power, it can be operated in bridge mode, giving a whopping 960W into 4 Ohm and 540W into 8 Ohm loudspeakers!!! The output distortion is pretty low too at only 0.02% THD+N at 100W into 4 Ohm or 50W into 8 Ohm loudspeakers. The chip comes with output over-current and short-circuits protection; that is if anything bad happens. You can see that the 2 little polypropylene capacitors on my Tripath TA3020 module (bottom middle part, just beside left and right of the white connector) are removed and wires are connected to the connectors to link it to the external high quality capacitors. The 2 huge inductors on the top are the filter coils that are made on Micrometals T106-2 core material, by winding 30 turns of 1.2mm (16AWG) copper wire. This is one of the important components for class T / class D modules. If they’re some small flimsy ones, skip them!!! The PCB is another consideration factor. It has to be able to carry the current or it would be burnt. The PCB here uses 70um or 2 oz copper tracks and it should be sufficient to withstand the current they’ve to carry. When you decide to get the modules, check if these are made of quality materials and designed with additional headroom. 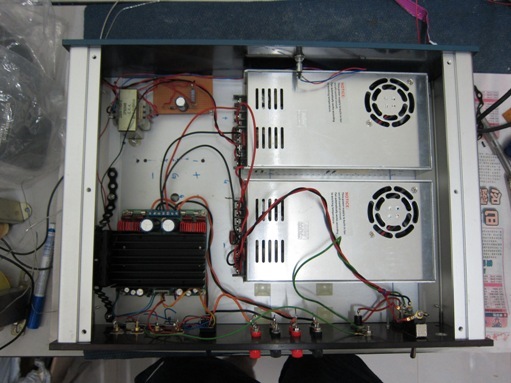 To power the unit, +/- 50Vd to 60Vdc bi-polar power supply is needed. The power supplies needs to be beefy if you want it to sound relaxed and in control / with authority. Wimpy power supplies will work but it will not get you good sound. For this application I chose the MeanWell S-350 350W switch mode power supply to do the job of supplying the juice. 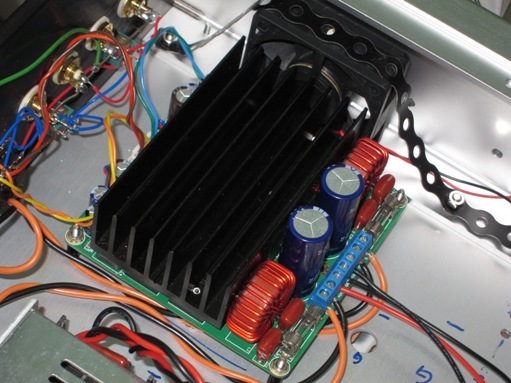 Two MeanWell 350W SMPS are used to create the bi-polar power supply, stacked together as the below picture. I’ve used many MeanWell in my amplifiers and I find that they’re quite useful when size & weight are limiting factors. I used them with Tripath TA2020 and they worked very well. The sound is pretty good as well. The only thing you need to take note is to install a EMI/RFI/audio filter at the mains just before the SMPS to reduce the noise from this SMPS to your other equipment on the same power line. With 750W on hand with the MeanWell S-350W SMPS, we’re having ample of reserve power and that is highly desired for the end results, not to mention that the Tripath TA3020 module + SMPS will last longer too! Do take note on this: to stack SMPS together, we need to make sure the output common (-V) is not shorted to actual ground. 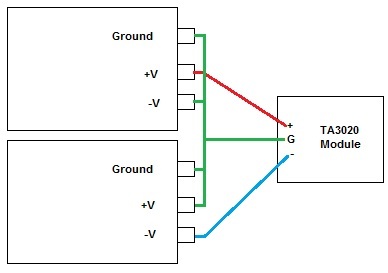 You will damage both the SMPS and the Tripath TA3020 module if you ground the –V of the SMPS. Refer to above diagram for the connection. Only ground the GREEN line to earth. The blue (-V) and red (+V) are the bi-polar lines. I chose the 48V version and actually tuned it much lower using the adjustable knob contained in the SMPS module itself. This gets me lesser output power but it is already more than enough for my speakers with ~92dB/w/m and above. EMI filter is integrated too into this SMPS and therefore the noise floor is lower. The picture shown in this page is actually the version before modifications. The final tweaked version actually has film bypass capacitors of 0.22uF + 1uF as well as a pair of 10,000uF electrolytic (Nichicon Gold) on the MeanWell S-350W SMPS to further reduce the ripple and noise, as well as provide enough transient current supply to the Tripath TA3020 amplifier. If one uses traditional PSU with bridge rectifier, the supply capacitors are recommended to be of at least 22,000uF for each rail. The input capacitors are changed too by the way, to paper in oil type for my case. A small fan is installed too to run at a very low speed to cool the Tripath TA3020 heatsink. Although it does not need it in my case, but adding one does prolong the lifespan of the components especially the electrolytic capacitors on board. If you run it at high power, it is highly recommended! I would recommend users to upgrade the input capacitors on the module itself to something that is more airy and extended in the highs in nature. 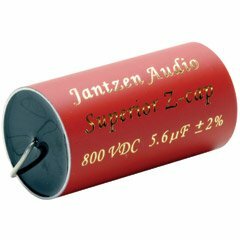 The Jantzen Z-silver / Z-Superior capacitor are good choice. Of course, if you want to splash on it, the Jensen or Mundorf Silver In Oil capacitors are excellent choices as well. 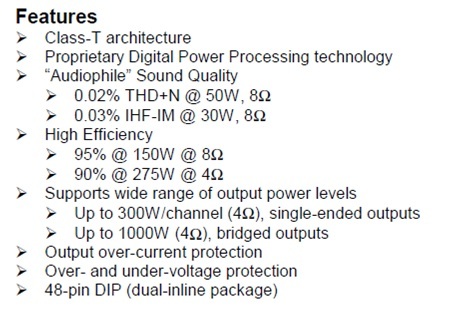 Due to the nature of class-T/D design, as well as the character of Tripath class-T chips, the highs will not be as extended compared to properly designed amplifiers. 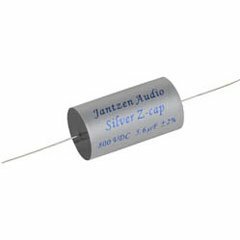 Upgrading with high quality capacitors would help to produce better highs to the tonality. Character: clean and articulate, neutral with slight tilt towards the warm side but not as warm as the smaller Tripath brethrens. Not as “real” and warm as tube amplifiers but close. Very 3-dimensional. Speed: fast, rhythmic, solid fast bass. It would like it more if paired with a tube preamplifier to mellow it down and add more body and harmonics to the sound. This combination would be perfect – power of solid state amplifier with slight warmth of tube! if you have very efficient speakers, go for the smaller brothers like Tripath TA2022, TA2024, TA2020 or TA2021. If you’ve power hungry speakers, this is THE ONE to get! On a side note, Audio Research did use similar Tripath chips in their line of products, the 150.2 and 300.2 power amplifiers with conventional power supply. Do check out the reviews online to have a feel on its’ strength and characters.